“FAR from this year being the record, the hottest summer was actually back in 1900. This summer only ranks 5th, behind 2017, 1902 and 2006. THE summers of 1884 and 1901 are also close behind. EXCELLENT investigative work, again, by Mr. Paul Homewood. THE precise job that the mainstream media should and must be doing in order to keep a check on government and its institutions. BUT, just as our top ‘scientific’ organisations have been captured by environmental elites, so too have the majority-Leftist mainstream media. AND, for the mainstream media – keeping “truth to power” in the area of the ‘environment’ would mean sanitising their man-made global warming narrative that they’ve invested so much political capital, ideology and personal ego into for decades. Not gonna happen! ERGO, tough times indeed for “truth to power” to exist in the fashionable age of climate change virtue-signalling, driven by politics, propaganda, bureaucratic pseudoscience and trillions of dollars of taxpayers hard-earned. Australia has experienced its hottest summer on record, according to the nation’s Bureau of Meteorology. Hundreds of individual heat records were shattered across the country over the past three months. The warm weather, 2.14C above the long-term average, caused bushfires, blackouts and a rise in hospital admissions. Wildlife also suffered, with reports of mass deaths of wild horses, native bats and fish. 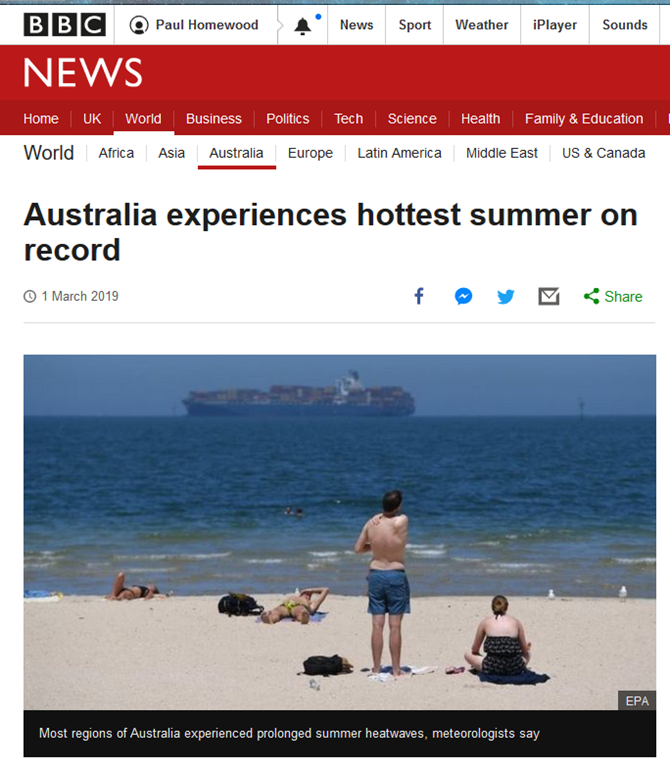 “The real standout was just how widespread and prolonged each heatwave was – almost everywhere was affected,” climatologist Blair Trewin told the BBC. Temperatures had exceeded the previous hottest summer in 2012-13 by nearly 1C, he added – “a very large margin for a national record”. HOBART. Saturday. — A fall of snow on Mt. Wellington closed a week of weather conditions in Hobart unprecedented in the memory of those who can go back 40 years. Early in the week the weather was hot and sultry, and the humidity was us unusual for Hobart as it was uncomfortable. On Thursday the humidity was more than 10 per cent, in excess of the average for this time of the year. Rain storms threatened on Friday morning, and between 3 p.m. and 9 a.m. today, 218 points of rain was registered and another 11 points by 3 p.m. Snow began to fall on the mountain last night, and continued during the early hours this morning. There was a white mantle about 2 inches thick on the mountain to-day. Visitors have found the conditions most trying. THIS report was from Monday the 7th of February, 1930 during summer in Australia. CARBON “pollution” at the time was 311 PPM. “From record-heat to snow in Tasmania”. Snow is falling in Tasmania today, just four days after the state experienced it hottest March weather on record. Autumn is a time of contrasting weather in southern Australia, as hot air lingering over the mainland after summer clashes with cold air surging out of the Southern Ocean. Image: Cold air passing over Tasmania on Wednesday. IF this happened today, the usual global warming climate change hysterics would be demanding that “the children” skip school and march in the streets.